Till 5 pm, Jammu and Kashmir registered polling percentage of 54.49 percent in the two parliamentary seats — Jammu and Baramulla — on Thursday. Two security personnel have been injured in an IED blast and firing by naxals in Etapalli of Gadchiroli district when they were returning to the base camp along with the polling party today. The injured jawans are being brought to Nagpur, reported ANI. According to ANI, BSP leader SC mishra said that the party has registered another complaint with Election Commision alleging EVM tampering. "We have sent them (EC) a video clip of EVM, in which it is seen that when the elephant symbol (of BSP) is being pressed but vote is going to BJP's lotus symbol. Our people had complained against it but no action was taken," he told ANI. According to ANI, one STF Jawan has been injured in an encounter with Naxalites in Chattisgarh. The security forces had kileld a Naxal in the ecnoutner which took place in Orcha in Chattisgarh. The police have returned to Orchha police station, reports said. Electronic Voting Machine (EVM) and VVPAT being packed at a polling station in Haldwani after voting concludes. Though the final voter turnout is yet to be disclosed, Uttarakhand had registered 46.59 percent voting till 3 pm. 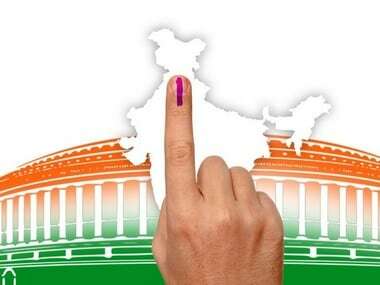 Polling is beihg held in Uttarakhand in single phase in the five Lok Sabha constituencies — Tehri Garhwal, Garhwal, Almora, Nainital-Udhamsingh Nagar and Hardwar. 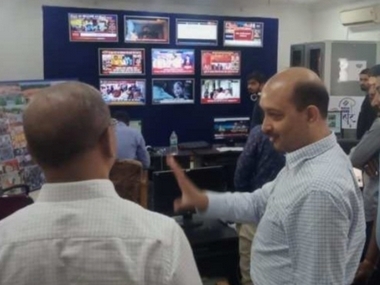 Election Commission officials were seen taking EVMs and VVPATs to the strong room as the polling for the first phase of Lok Sabha Elections concluded in Maoist-hit Jamui, according to ANI. When Firstpost visited this booth, the village inspector (kotwar) said that on Tuesday, Maoists visited the village at night and warned voters to abstain from voting. They had beaten up the 'village mukhiya (village head)', who is in the hospital at present. According to ANI, the overall voter turnout in Maharashtra till 3 pm was 46.13 percent. In Maharashtra, voting was held in seven parliamentary constituencies,e ach of which received over 40 percent polling till 3 pm. Gadchiroli-Chimur, an ST-reserved Lok Sabha seat, witnessed the highest turnout at 57 percent. Gachiroli had witnessed Maoist attack on Wednesday on the eve of the first phase of polling, in which one CRPF jawan was injured. 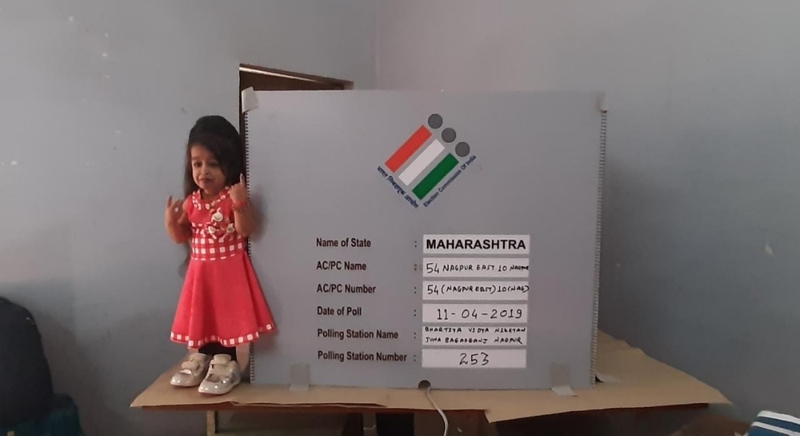 The other six constituencies in Maharahstra were polling was held were Wardha (43.90 percent), Ramtek-SC (44.5 percent), Nagpur (41.25 percent), Bhandara-Gondiya (49.05 percent), Chandrapur (46.30 percent) and Yavatmal-Washim (43.35 percent). Jyothi Amge, world's smallest woman, casts her vote at a polling station in Nagpur. Jyoti Kisange Amge, an Indian woman and actress notable for being the world's smallest living woman according to Guinness World Records, cast her vote at the Nagpur constituency today. In Bihar, Aurangabad recorded 38.50 percent voting, Gaya recorded 44 percent polling and Nawada polled 43 percent votes. In Naxal-hit Jamui, where polling concluded at 4 pm, 34 percent votes were cast till 3 pm. Gaya has been inflicted with Maoist movement for a long time but a Left candidate has never won from this seat. Although older trends shows that voting pattern has not been affected by caste arithmetic. But since last two decades political parties have been fielding candidates of Musahars community, as 30 percent of the voting population of Musahars dwell in Bihar's Gaya. They plays a decisive role in a win or loss. In 2009 and 2014 general election Hari Manjhi won this seat on BJP ticket. Hari Manjhi's name was in headlines last year when his son was arrested on the charge of consuming liquor which is banned in Bihar. This time NDA has fielded JD(U)'s Vijay Manjhi. In 2014 general election JDU was fighting alone and he had given ticket to Jitanram Manjhi. Polling booth number 52 Machkot Jagdalpur AC (96 percent) and Jeeragaon (97.45 percent) of Bastar Loksabha recorded huge participation of voters. These booths fall in Naxal sensitive area. Despite boycott call of election by the Maoists, voters defying their call came out in huge numbers to cast their votes. This shows people's faith in democracy and clear cut indication of ballots victory over bullets. The Bahujan Samaj Party took note of the incident of Dalit voter being turned away in Kairana and said that the party has recieved similar reports from across the state. BSP supremo Mayawati said that the party will go to the Election Commission and alleged that members of the backward community were baton charged. Lok Sabha elections voting 1st phase: Gautam Budhha Nagar Lok Sabha seat registered 50.42 percent voting by 3 pm with Jewar Vidhan Sabha at 56 percent, Dadri at 52.20 percent and Noida at 43.08 percent. Uttarakhand has recorded 46.59 percent voting till 3 pm in all of its five constituencies. The cosntituency wise breakup was not available immediately; it will be updated as and when it comes. Union minister and BJP leader Smriti Irani filed her nomination papers from the Amethi Lok Sabha constituency on Thursday. Uttar Pradesh chief minister Yogi Adityanath and senior Bharatiya Janata Party (BJP) leaders also accompanied her. She also held a road show in the constituency, which saw a huge crowd presence. As polling is underway in eight seats of Uttar Pradesh, residents of the only village of the state located on the other side of the Yamuna in Haryana have boycotted elections after waiting for a road to connect them to Noida and Greater Noida for five years. In Bihar's Jamui this time, Lok Janshakti Party leader Chirag Paswan, who made a successful debut five years ago is up against Bhudeo Chaudhary, who won the seat in the first general elections in 2009 that followed the creation of the constituency in 2008. An altered caste equation - because of the reorganised alliances in the state - could make Paswan's going tougher this time. Saharanpur DM later confirmed that over 100 EVMs have been replaced in the district so far. BSF personnel fired shots in the air after few people tried to cast vote without voter ID at a polling station in Shamli. Naxals triggered an IED blast near a polling booth in Maharashtra's Gadchroli district Thursday while voting was underway, police said. The IED (improvised explosive device) blast took place around 10.30 am in Waghezari area, around 150 metres from the polling booth where people were standing in queues to cast their votes for the Lok Sabha election, an official said. As polling for the first phase of Lok Sabha elections is underway in eight constituencies in Uttar Pradesh, firing has been reported from Kairana after villagers clashed with the security forces. 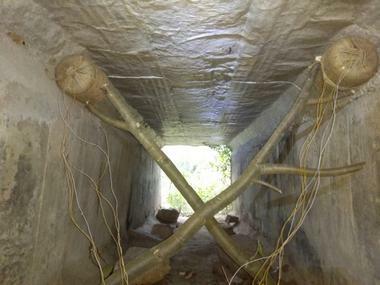 Bomb which was installed in a culvert was found and defused by a joint team of BSF personnel and district police in Koilibeda of Kanker district, Chhattisgarh. In Chhattisgarh, three polling booths from Konge and Pangud villages in Narayanpur district, classified as ‘highly sensitive areas’, were moved to Chhote Bethia village in Pakhanjur panchayat of Kanker district. This added distance through the dense forests, dominated by naxals, may be a couple of hours longer for voters of the region. By road, this distance is 214 km, which takes a good 5 hours 14 minutes through Chhattisgarh’s Red Belt, where road constructions have been prime target of Naxals. Moving the booths has resulted in nil or negligible voting until 11am. While no votes have been caste at Booth no 1, two votes were caste in Booth no 2. Booth no 1 has 166 voters listed, including 81 males and 85 females, and booth no 2 has 257 voters listed, including 151 males and 146 females. Elections are underway at five parliamentary constituencies in the state. Tehri Garhwal, Haridwar, Nainital, Almora, Garhwal. In Haridwar, the overall voter sentiment largely seems inclined towards the BJP, but the interior pockets - which have a significant number of Muslim and SC/ST votes are largely looking at the BSP as the an alternative. As for the state's only regional party, the Uttarakhand Kranti Dal will be fighting from all five seats; UKD had failed to secure a single seat in the last two LS polls. The incarcerated RJD supremo was not very hopeful about getting relief from the Supreme Court and merrily stepping out of prison, so he had already prepared a statement in the form of a letter addressed to the people of Bihar. The letter is carefully addressed to the Dalits and backward classes and urges them to remain united and "defeat the forces hell bent on snatching their fundamental and constitutional rights including reservation". The urgency to write such a letter possibly came amid apprehension of a split in votes of these classes. Former Jammu and Kashmir chief minister Omar Abdullah has tweeted out a video of a polling officer clarifying that polling was delayed in Poonch district at several polling stations because the EVM button against the Congress party was not working. In the naxal-hit areas of Bastar lok Sabha constituency, elderly voters have shown great enthusiasm. In this video, a 120-year-old man can be seen walking up to the poll boooth to cast his vote in Kirandul. Nitin Gadkari's family cast their vote at Municipal Corporation School, Mahal area, Nagpur. After seeking blessings from Dawoodi Bohra Muslims, Union Minister and BJP candidate from Nagpur, Nitin Gadkari, leaves to cast his vote. Nagpur is also RSS headquarters, where Gadkari won in 2014 as well. He has been fielded against Congress' Nana Patole. Vote in Nagpur, apart from depending on job and agrarian crisis, could also be divided on caste lines. Patole, from Kunbi community, could take the Muslim and Dalit vote, while Gadkari, a Brahmin, could find himself in a minority position. 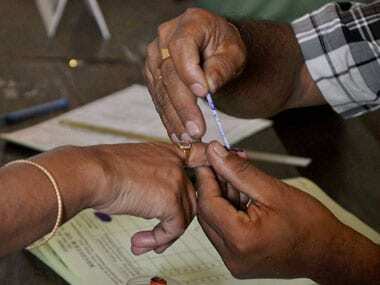 The Bastar Lok Sabha constituency has recorded 10 percent polling till 9 am today morning. Early trends from sensitive areas suggest normal turnout despite Naxal threats. Reports have said that the internet services have been suspended in Jammu and Baramulla districs where polling is currently underway till 6 pm when the polling concludes. Polling has begun in a primary school at Konta block in Sukma district in South Bastar. Konta is highly Naxal sensitive block. According to CNN-News18, till 9 am voter turnout till 9 am in Saharanpur was eight percent, Kairana was at 10 percent, Muzaffarnagar at 10 percent, Meerut at 10 percent, Bijnor at 11 percent, Baghpat at 11 percent, Ghaziabad at 12 percent and Gautam Budh Nagar at 12 percent. Baghpat recorded a voter turnout of 11 percent while the sugarcane belt of Meerut has recorded 10 percent polling. In Baghpat, former Mumbai Police commissioner Satya Pal Singh is seeking re-election. According to 101Reporters, Gaya recorded 13 percent voting, Nawada five percent, Aurangabad 6.2 percent and Jamui 5.8 percent till 9 am. Voters queue up in Shyamgiri area of Dantewada in Chhattisgarh. This is the same place where BJP MLA Bhima Mandavi was killed in a Naxal attack two days ago. The attack was deemed an effort to derail the polling process and induce fear in voters to prevent them from participating in elections. In another incident of Naxal aggression, reports said that a threatening notes was recovered from outside the Halbaras polling booth in Kuwakonda area of Dantewada. However, security officials have said that the voting can be continued. An IED blast has been reported from Narayanpur within one kilometre distance from a polling booth. The incident occured at at 4 am when ITBP troops were going to a booth. Although no damage was caused by the exposion, a high alert has been sounded in Bastar, with intel inputs suggesting that the Naxals may try to disrupt polling again. Reports said that voting could not be started at booth number 225 in Gautam Buddha Nagar owing to technical snag in the EVM machines. The voters have turned up in large numbers and are miffed at the delay. Similar reports filtered in from Barot, in Baghpat from Booth no 124 and 128. Voters created a ruckus after voting was halted at the booths due to a technical glitch in the EVMs. With inputs from Pranav Bharadwaj, 101Reporters. Four constituencies Gaya, Nawada, Jamui and Aurangabad are going to poll today. Total 44 candidates including including former chief minister Jitanram Manjhi, Chirag Paswan son of Lok Janshakti Party chief Rambilas Paswan, convicted RJD leader Rajballabh Yadav's wife, and RLSP leader Bhudeb Choudhary are fighting. 45 thousand polling personnel have been deputed. Total 60 lakh voters are going to exercise their votes. 7486 polling booth have been installed. News18 reported that an explosive device has reportedly been found outside the Anwaran Salaiya booth number 9 of the Gaya Lok Sabha seat. The local police authorities have sent the bomb disposal squad and the voting has begun at a safe distance from the site where the explosive were discovered. The Naxal-hit Gadchiroli district, which is a reserved seat for Scheduled Tribes candidates, is up for grabs in the first phase. Here, the sitting BJP MP Ashok Nete is locking horns with Congress candidate Namdeo Usendi. Bastar Lok Sabha constituency under LWE category in south Chhattisgarh, is reserved for Schedule Tribes candidates. There are seven candidates in fray for this single LS seat: Baiduram Kashyap (BJP), Deepak Baij (Congress), Aituram Mandavi (BSP), Ramu Ram Mourya (CPI), Manish Prasad Nag (Ambedkarite Party of India), Mangalaram Karma (Akhil Bharat Samagra Kranti Party) and Suresh alias Sargiram Kawasi (Shiv Sena). However, the main contest will be between the BJP and the Congress. The sitting BJP Member of Parliament is Dinesh Kashyap, son of former four-term BJP MP from Bastar Baliram Kashyap — known as ‘Balasaheb Thackeray of Bastar’, has been denied the ticket. Polling station set up in Jagti Colony, for kashmiri migrants hailing from Baramulla constituency wears a deserted look. Jagti Colony is a resettlement camp for displaced Kashmiri Pandit migrants, and is currently home to 4000 Hindu families, after the exodus in 1990s. The camp is located in Nagrota Area of Jammu district of Jammu and Kashmir. Image by Randeep Kher, 101Reporters. All five Lok Sabha seats from the state are going to polls in the first phase. There are 52 candidates in fray including the two top parties, BJP and Congress. There are 78, 54,023 registered voters in the state out of which 4053944 are males while 3711220 are females. RSS Chief Mohan Bhagwat was among the first few voters on booth number 216 in Nagpur. Appealing to the youth of the country to move out of their houses and vote, Bhagwat said, "Voting is our duty, everyone should ensure they cast their vote." Singh is the joint candidate of Samajwadi Party, Bahujan Samaj Party and RLD (gathbandhan). Jammu and Kashmir's Baramulla and Jammu seats will poll between 7 am and 6 pm today. The lone Bastar seat is going to poll in first phase from the state. The polling will be held as per the following schedule. Saharanpur, Kairana, Muzaffarnagar, Bijnor, Meerut, Baghpat, Ghaziabad, and Gautam Budhha Nagar: The eights constituencies that are going to polls in the first phase will all poll between 7 am to 6 pm today. To know more about Uttar Pradesh Lok Sabha election details, look out for the posts tagged with the state's name in red. The general election of 2019, the biggest democratic electoral exercise, is finally here. After an intense round of campaigning, acerbic name calling and a volley of allegations and counter-allegations, around one-third of the electorate in 91 seats across 20 states will exercise their franchise today. Here is a list of states we will be covering in the north zone. For updates on other states, follow our live blogs for southern, and eastern states. Maharashtra: Two security personnel have been injured in an IED blast and firing by naxals in Etapalli of Gadchiroli district when they were returning to the base camp along with the polling party today. The injured jawans are being brought to Nagpur. 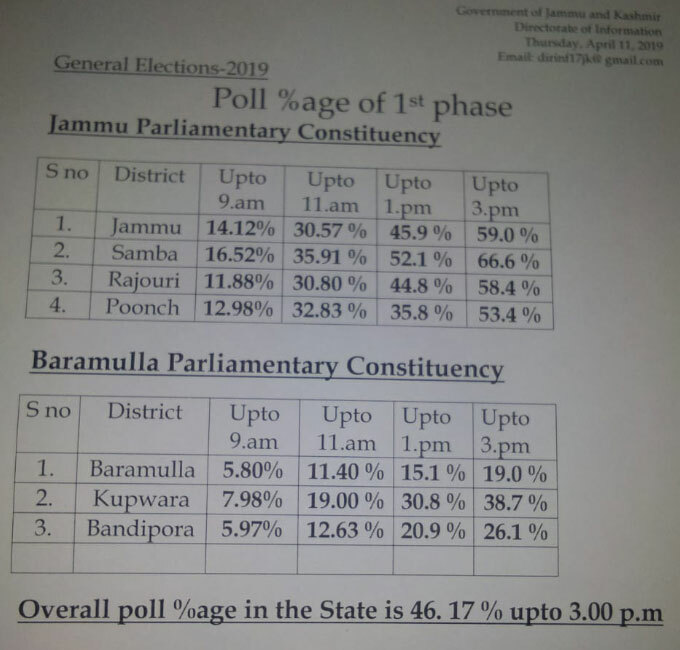 In the Jammu parliamentary constituency, Samba Assembly constituency recorded 66.6 percent till 3 pm while Kupwara Assembly seat witnessed 38.7 percent voter turnout till 3 pm. Acording to ANI, troops of 113 Battalion CRPF were fired upon while they were returning from booth number 283 in Tumrikasa Village of Gadchiroli's Dhanora at 4 pm, the troop retaliated. No injuries/loss has been reported. More details awaited. While the recent elections in Kashmir have been marred by violence or low voter turnout, Uri in the poll-bound north Kashmir's Baramulla constituency saw long queues of voters exercising their franchise. This border town has been at the forefront of hostilities between India and Pakistan. Residents said they are voting for a "sense of security and bunkers" for the residents living along the Line of Control. 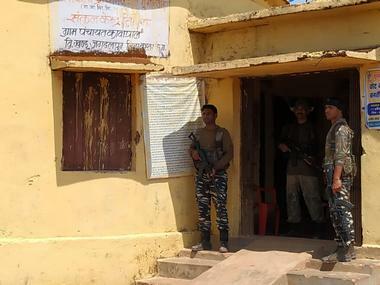 CRPF personnel guarding the Naxal hyper-sensitive polling booth at village Gumalwada, 75 kilometres from Jagdalpur town. Security personnel in the village are a armed with sniper rifles and UBGL guns, which speaks of the fear looming on voters due to Maoists. The Kashmir valley witnessed a complete shutdown as the Baramulla Parliamentary constituency in north Kashmir and Jammu Parliamentary Constituency went to polls on Tuesday. In Valley all the shops, educational institutes and business establishments remained closed. The traffic was missing from the from the roads. There were few clashes reported from area in north Kashmir but polling remined peacfull till 3: 00 pm. The shutdown is being observed in response to a strike call given by Hurriyat Conference, who had given a call for boycott of the polls. But amid shutdown, 35. 52 percent votes were polled till 1:00 pm in state’s two constituencies – Baramulla and Jammu. 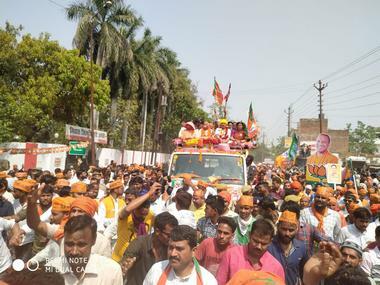 Union minister and BJP leader Smriti Irani filed her nomination from Amethi parliamentary constituency after holding a massive roadshow. 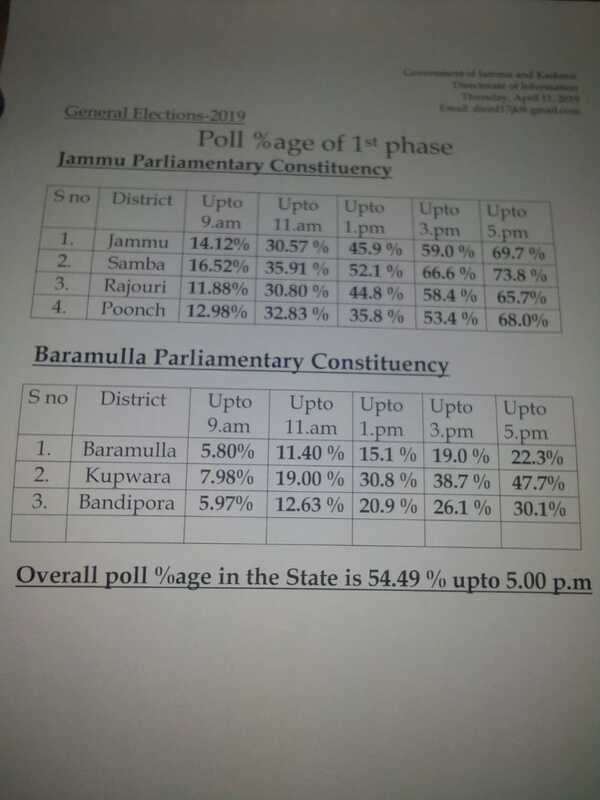 The Jammu and Baramulla parliamentary constituencies have recorded a total of 24.66 percent polling till 11 am today. "There is some misinformation being spread that some Policemen have been distributed food from a Political party. This is absolutely wrong. At local level some food packets were procured from Namo Food Shop and not from any political Party. Some people are spreading wrong and politically motivated rumours. And there is no official order to procure food from any particular food outlet. 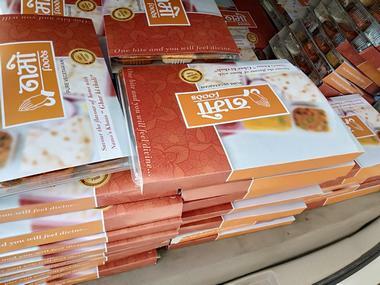 Reports of NaMo food packets being distributed near poll booths in Noida have come out. Uttar Pradesh Chief Election Officer L Venkateshwarlu has sought a report from Noida District Magistrare on this issue. Meanwhile, the ADM of Shamli has clarified that a Dalit man, who was not allowed to vote in Uttar Pradesh' Shamli district because he lacked identity proof, refuting claims of caste discrimination. Chhattisgarh Police killed one Naxal in an encounter at Orcha, Narayanpur in Chhattisgarh on Thursday. Inspector General, Chhattisgarh police (Bastar range ) Vivekananda confirmed the incident. One STF jawan was also injured in the incident. Meanwhile, Maharashtra registered overall voter turnout of 46.13 percent till 3 pm. According to ANI, in Maharaashtra polling was held in seven parliamentary constituencies, each of which received over 40 percent polling till 3 pm. Gadchiroli-Chimur, an ST-reserved Lok Sabha seat, witnessed the highest turnout at 57 percent. In Gadchirolli, two security personnel were injured in an IED blast and firing onThursday. Maoist-affected Gachiroli had witnessed attack on Wednesday on the eve of the first phase of polling as well, in which one CRPF jawan was injured. Clashes broke out between BJP and RJD workers in Nawada constituency, media reports said. BJP workers alleged that RJD workers had forced their way into a polling booth where they were forcing women voters to vote for their candidates. When BJP workers tried to oppose this, the situation worsened and led to clashes, India Today reported. The Bahujan Samaj Party took note of the incident of Dalit voter being turned away in Kairana and said that the party has received similar reports from across the state. BSP supremo Mayawati said that the party will go to the Election Commission and alleged that members of the backward community were baton charged. Few Dalit voters in Shamli Naya Bazaar have alleged that they were not allowed to cast their votes despite having their names on the voters list. A voter broke down while narrating his ordeal as he alleged that he could find his name in the electoral roll and also had the voting slip. He claimed that the polling officers did not allow them to cast their vote because they were Dalits. 10.2 percent voting has been recorded in Naxal-hit Bastar seat in Chhattisgarh till 9 am. 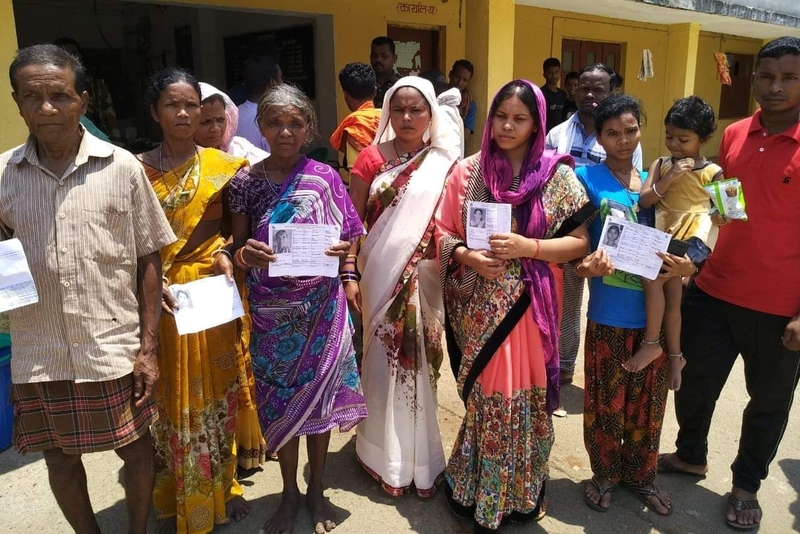 Meanwhile, in Shyamgiri area of Dantewada in Chhattisgarh, voters decided to defy Naxal threats and come out to vote. This is the same place where BJP MLA Bhima Mandavi was killed in a Naxal attack two days ago. The attack was deemed an effort to derail the polling process and induce fear in voters to prevent them from participating in elections. Former Union minister and sitting BJP MP from Muzaffarnagar Sanjeev Balyan has complained about 'fake voting' at some booths. The BJP leader was apparently miffed at EC officials for allowing burqa-clad women to cast their vote without checking their identity. While raising his point, Balyan said. "EC officials said they don't have a woman official to identify the faces of women in burqa, but I say that what's the problem if male officers see their faces. And if they have a problem, then they should sit at home." The BJP leader, however, within seconds clarified his comment saying, "What I mean is that this is EC officials' responsibility. Under rules, they should at least verify the identities of voters." Among the biggest fights in phase 1, are two Union ministers in northern states. Union Minister Nitin Gadkari, the sitting BJP lawmaker in Nagpur, is pitted against Congress candidate Nana Patole in Maharashtra's Nagpur. Patole was a BJP candidate in the last term, but he later switched over to Congress citing autocracy in party's top brass. Union Minister Satya Pal Singh, a retired IPS officer is seeking re-election from Uttar Pradesh's Baghpat Lok Sabha seat as a BJP candidate, and is up against Jayant Chaudhary, the son of Rashtriya Lok Dal (RLD) founder Ajit Singh. Union Minister Nitin Gadkari, the sitting BJP lawmaker, is pitted against Congress candidate Nana Patole in Maharashtra's Nagpur. In the first phase of Lok Sabha election, polling will be held in 91 out of 543 Lok Sabha constituencies spread over 20 states and Union Territories on Thursday. In northern India, polling will be held in Bihar, Uttar Pradesh, Chhattisgarh, Uttarakhand, Maharashtra, and Jammu and Kashmir. While the voting in most of the constituencies will begin at 7 am and end by 6 pm, timings in areas affected by Left Wing Extremism (LWE) could be either 7 am to 5 pm, 7 am-4 pm, or 7 am-3 pm, according to the Press Information Bureau. In Bihar, four Lok Sabha constituencies — Gaya, Jamui, Nawada and Aurangabad — will go to polls on Thursday where nearly six million voters would decide the fate of 44 candidates. Prominent among those who are the fray in these constituencies are LJP MP from Jamui Chirag Paswan who is locked in a straight contest with his predecessor RLSP's Bhudeo Chaudhary. Chaudhary, who was earlier with the JD(U), had won the seat in 2009 as an NDA candidate. 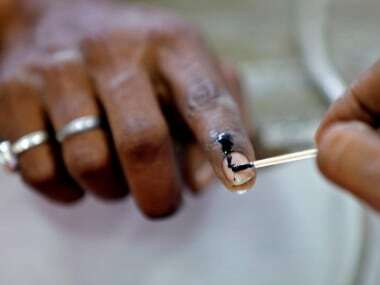 In Uttar Pradesh, polling will take place in eight Lok Sabha seats of the western region from 7 am to 6 pm. The ruling Bharatiya Janata Party (BJP) is making all-out efforts to retain all the eight Lok Sabha seats while the fledgling Samajwadi Party-Bahujan Samaj Party-Rashtriya Lok Dal alliance (also known as gathbandhan) too is going all out to upset the saffron party's prospects. For the saffron party, the Kairana parliamentary constituency holds immense significance as it had tasted defeat in the Lok Sabha bye-election in 2018. The fate of three Union ministers — VK Singh (Ghaziabad), Satyapal Singh (Baghpat) and Mahesh Sharma (Gautam Buddha Nagar) will also be tested in this phase. Prominent names among the 96 candidates in fray during the first phase in Uttar Pradesh include Imran Masood (Congress) and Raghav Lakhanpal (BJP) from Saharanpur, and Tabassum Begum (SP) from Kairana. In Bijnor, Congress candidate and former Uttar Pradesh minister (during Mayawati's tenure) Naseemuddin Siddiqui will challenge Raja Bharatendra Singh, while in Meerut, BJP's Rajendra Agarwal will be hoping for a repeat of 2014, while BSP's Hazi Mohammad Yaqub will be trying to checkmate him. 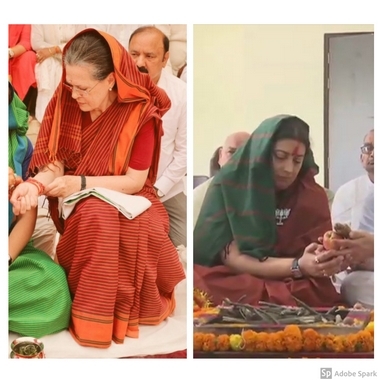 Dolly Sharma of the Congress is contesting against Union minister VK Singh, while in Gautam Buddh Nagar, it's Union minister and BJP candidate Mahesh Sharma versus Arvind Kumar Singh of the Congress. The Naxal-affected Bastar is the only Lok Sabha constituency in Chhattisgarh going to polls on Thursday amid tight security and looming threat from Maoists who have called for a boycott of elections. In a grim reminder of the challenges being faced by security forces, Naxals carried out a major attack on Tuesday in Dantewada district, which is part of the Bastar parliamentary constituency, the only seat in the state to vote in the first phase. BJP MLA Bheema Mandavi and four police personnel were killed in the attack which came two days before polling. The Bastar Lok Sabha (ST) constituency, where seven candidates are in the fray, consists of eight Assembly seats. Polling in four of them — Dantewada, Konta, Bijapur and Narayanpur — will be held from 7 am to 3 pm. The remaining four Assembly segments — Bastar, Chitrakot, Kondagaon and Jagdalpur — will see voting between 7 am and 5 pm. In Uttarakhand, an interesting battle is on the cards in the five Lok Sabha seats going to polls on Thursday with the BJP banking on the success of Balakot air strikes to garner votes and the Congress betting on the alleged Rafale scam to dent the prospects of the saffron party. As in the past elections, the BJP and the Congress are once again locked in straight contests on all the five seats which have been going en bloc to either of them alternately. In 2009, the Congress had won all the seats while the BJP wrested them in 2014. The saffron party is confident of retaining its 5-0 tally while the Congress is making every effort to stage a comeback in the hill-state after the 2017 Assembly poll rout when the BJP won 57 of the 70 seats to storm to power. 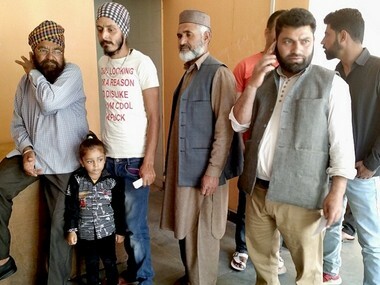 In Jammu and Kashmir, more than 33 lakh voters will decide the fate of 33 candidates in the twin parliamentary constituencies of Jammu and Baramulla which are going to polls on Thursday. The separatists have called for a strike on Thursday to protest against the elections and the "NIA aggression" against Hurriyat Conference leaders and their kin.